stores that carry kitchen items. 2 decorative glass corked bottles. 1. 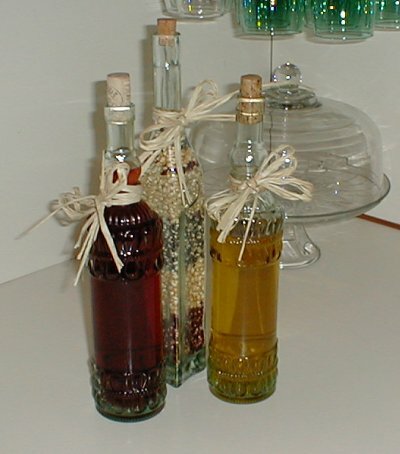 Fill one bottle with oil and the other with vinegar. 2. Cut the raffia in half leaving two 1 ½ foot pieces. 3. Take one strand of raffia and rap it around the neck of the bottle and then form a bow. 4. Repeat this step on the other bottle. 5. Place the bottles on your kitchen counter top for display and easy access. at your finger tips. Not to mention they give your kitchen a feeling of home. Also makes a nice popcorn display.